An invitational was hosted yesterday on Nintendo’s E3 stream for Splatoon 2, featuring four teams competing for a sweet silver squid trophy. Surprisingly, it was a strong showing for the game’s competitive aspirations. E3 has had no shortage of “esports” presentations, from Electronic Arts showing off Star Wars: Battlefront II with a commentated live match to a random shoutcaster appearing on the stage mid-presentation. Most of these vary from ineffective to just plain wrong, and come off as forcing a game to be competitive, ignoring the community groundswell that pushes competitive scenes further than any shareholder presentation can. The Splatoon 2 Inkling Invitational was by all means a showcase for the game and its competitive potential. What set it apart was the willingness to step aside and let the game speak for itself, allowing the competition between four top squid-squads to put the game on display. In a competitive Splatoon match, two teams of four compete on different maps and modes. Most of them involve territory control to some degree, measured by how much ink covers the ground. Turf War literally measures the percentage of map covered by each team in ink, while Tower Control has a payload that moves back and forth based on who’s inked it more. Splat Zone is a king-of-the-hill ink contest, while Rainmaker is the outlier: each team tries to control the eponymous Rainmaker weapon and carry it into the other team’s base. Splatoon has its own grassroots scene of players, who often hook up multiple Wii U’s in unofficial competitions and side events, like the recent Smash ‘n’ Splash 3 .These were the players that Nintendo chose to feature, rather than popular but generalist gaming personalities, in their tournament. Splatoon 2 nails the spectator experience, allowing the camera to follow individual players, pull out for a free-floating third-person camera or go omniscient for a map overview. The screen is mostly clutter-free, outside of busier moments in the match, and icons at the top help provide quick references when a super move is used or a player is respawning. Compared to most games, Splatoon 2 can seem almost frantic—players are constantly moving, ducking and diving into ink puddles, with “splats” (the Nintendo version of kills) happening fast. What results is a sense of energy and intensity from each match, as a game can come down the wire, with teams desperately trying to ink territory and stay alive. Where Splatoon 2 shines is in its ability to visibly portray spacing and map control. Concepts like those often seem ethereal to new spectators. It’s hard to explain to someone the control that a team can exert over a League or Dota map without physically standing there, or reading the distance between characters in a fighting game. Splatoon has its ink, a visible representation of a team’s presence on the field. It’s easy to understand that when there’s more purple ink than green, the purple team is probably winning. Not all the modes are winners; Rainmaker doesn’t have the same Recognizable At A Glance boon that Turf War or Tower maps do. But between the teams putting on several series of solid matches, and the commentators doing their part to both distill concepts and heighten the action, the Inkling Invitational did a better job of portraying a game’s competitive potential than any shouting man on a podium could. Really, it comes down to the tense moments between each team and the cool interactions feel unique to this type of game. 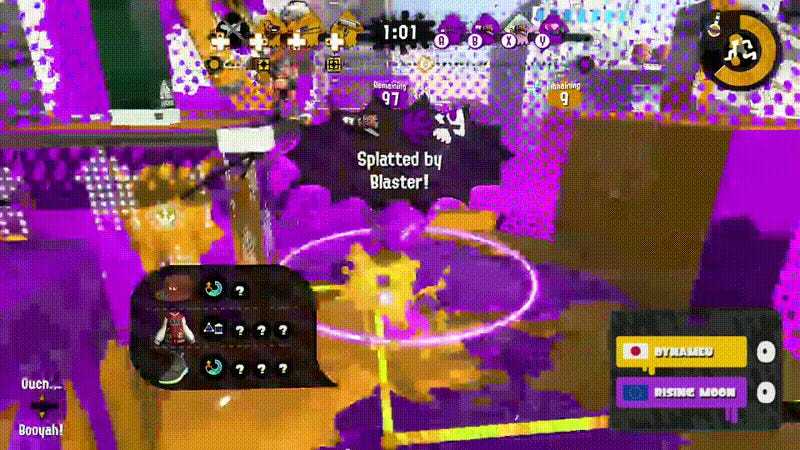 Sloshers, squid kids who use paint buckets, zoom around opening up lanes of attack for their offensive players. Rollers play the offense, leaping around and flinging lines of paint before crushing and rolling over squids. It’s a constant back-and-forth contest for territory, played out in rapid-fire skirmishes like the below clip from the tournament-deciding match between Dynameu and Deadbeat. Ink bombs come flying down from overhead, while splatters open up lanes of attack for squid kids zoom around in the ink, attempting to hold control of the tower long enough to secure the win. Now, there’s no Nintendo Seal of Approval for esports—the community determines what does or doesn’t succeed, and in the ever-growing market of competitive games, Splatoon 2 has a lot of competitors to deal with. But for once, I found myself watching a commentated match of a game streaming from a show floor, and I wasn’t groaning or rolling my eyes. If a jaded skeptic like me isn’t immediately averting my eyes and looking for where the Mario gameplay is at, there’s a chance there’s something to all of this.